There are few roleplaying games as famous or as wide-spread as Dungeons & Dragon 3.5 edition, so it’s no surprise that a big chunk of its player base was less than pleased when the edition went away. 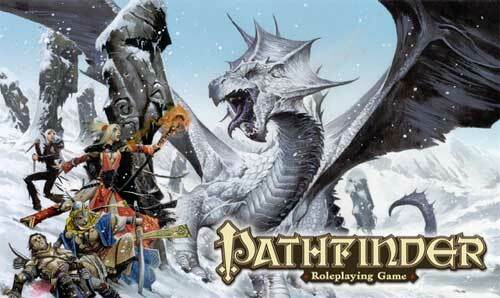 For them, Pathfinder might be the next best thing, if not the absolute best. Archetypes are a bit restrictive. No variety in (Anti-) Paladins. Audience: D&D 3.5 players. D20 players. High Fantasy, Sword & Sorcery, Medieval Setting fans. Thankfully, Paizo, the company previously responsible for both Dragon and Dungeon magazines, had D&D 3.5 players’ backs with Pathfinder. First starting as modules for D&D, it became its own game not long after D&D 4th released. Players quickly embraced Paizo when the company started taking player input in designing their rules, releasing beta material to be play-tested by GMs and players everywhere, a practice Wizards of the Coast has since adopted for D&D Next. Pathfinder RPG officially released in 2009 and since then, it’s kept on growing. Fighter down, Rogue is getting the hell out…this doesn’t look good! Part of that growth is thanks to the Pathfinder Society, an organization both in-game and outside. In the game, these are the journeymen, those traveling the world and recording major events and new discoveries. In our world, the Pathfinder Society Organized Play allows players anywhere to participate in a worldwide campaign with the Society’s Seasons, a number of modules each year in the organized campaign setting, influenced by the efforts of all other players around the world. Consider it a Massive Multiplayer Roleplaying Game, just on Tabletop. Mechanically speaking, Pathfinder reworks plenty of D&D 3.5’s rules, for the better. Skill rank maximum is set to your level, there are no cross-class skills, meaning you can use all of them and raise them for the same skill point cost, but your class skills have a +3 bonus to them (where in D&D 3.5, the maximum rank was level + 3). Grapple, disarm, and all other maneuvers have been streamlined into Combat Maneuver Bonus and Defense, allowing for all of them to be resolved with single rolls against a maneuver-specific defense, eliminating the bog-down D&D 3.5 suffered when it came to these special actions. Character health is higher than in 3.5, with the lowest class having a d6 die, up from d4, and tying Health Dice to Base Attack Bonus progression, standardizing them for ease of class creation and customization. And of course, there is no level loss. In D&D 3.5, when someone died and was brought back to life, or when someone failed the saving throw for level drain, they lost the level, meaning characters spent a long time removing an entire level from their sheet. In Pathfinder on the other hand, negative levels just add a cumulative -1 to all rolls, making it easier to play with. These changes are only a few Paizo made to the base 3.5 rules, making them more streamlined and easier to play, learn and master. We all know all adventurers start in loincloths! Character classes also received a substantial redesign, getting rid of many of the dead-level-syndrome many classes in D&D 3.5 suffered from, meaning they had many levels with no new class features (such as the Cleric, which received only a few features on its first level but got nothing else for a long time.). While there are still dead levels here and there, the gap is much smaller, with most classes having at least one new feature every other level. Classes aren’t the only ones with archetypes and additional options, as races have their own variants, allowing players to exchange the base race features and benefits with a wide range of alternatives. This system and the previous one actually mix together in the form of Racial Archetypes, such as the Buccaneer for Humans. These little chapter openers are really good! Pathfinder’s world is Golarion, and its core nations (the ones in their core rulebooks) are located on the continent of Avistan, each with a rich background and colorful characters and organizations and creatures for the characters to join and fight. You can spend days reading material on each of the nations, and they are all so well crafted, you’ll want to play in this setting even if you have to do it with different rules. Nations all have a theme around which their society revolves, and which makes them unique and provides countless adventure hooks. Andoran is a medieval republic, formed after a revolution in which power was given to the people. Cheliax is a decadent empire, made strong by their devilish ties, literally devilish. The Land of the Linnorm Kings is a frigid wasteland where the strong rule and where to become a King you need to singlehandedly kill a Linnorm, a huge Komodo dragon. Lastwall is a military nation, where only those actively serving the nation’s military have rights. Faith in the Pathfinder universe is actually one of my favourite things, with gods for all alignments and worship for all of them spread around the world. From the Paladin goddess of justice Iomedae to the Lawful Evil God of slavery, tyranny, pride and contracts Asmodeus, each god finds worship in every kingdom, sometimes not amenable, sometimes hidden, but the mere presence of their following adds layers to the roleplaying experience. In my own campaign I had players regularly interacting with evil god Clerics, especially Asmodeus clerics, since his Lawful Evil alignment meant he, and his priests, could be counted on to keep their words, as long as the price was met. The variety of gods however, brings the Paladin and its counterpart the Anti-Paladin into a shameful light. With the Paladin and Anti-Paladin taking up the extremes in the moral/law axes, it boggles the mind how there aren’t rules set up for Paladins for all other gods, and all other alignments, considering the hugely varied pantheon in Golarion. It’s often left to GMs everywhere, to house rule their Lawful Evil or Neutral Good Paladins, specifically tying them to each god by altering their class features, as the designers didn’t see past the classical D&D approach to these classes. Character creation, like in any other D20 game can be a short or a long affair, depending on whether you have a plan or not. If you don’t, or you’re new, it can take a long time to sift through all the available character options to create your new adventurer. For new players, the rulebooks are very well written and clearly explain all the rules, a welcome thing for both players and storytellers alike. It’s not just rules, however, but also stories and even small amounts of flavour text that line the books, with each chapter usually having a small story, helping to get the player much more interested in the game. My only complaint is there isn’t enough of it, as almost anything, from spells to feats to skills could’ve benefitted from an in-game reference or story, which always helps new storytellers learn how to describe these actions, and fun descriptions go a long way to get people to remember them. Speaking of books, while there are certainly a ton of them and book jumping to look for something specific is a given, the supplements themselves are very well organized and indexed, allowing you to easily find anything you need, unless your eyes stay glued to the fantastic art. In addition to that, there are a large number of online resources telling you where to find each thing, making the book trek much easier. While it has its flaws, Pathfinder Roleplaying Game is a fantastic game in the D20 3.5 system, giving old D&D players and newcomers alike a thoroughly crafted and intriguing world to play in. With tons of character options and streamlining of some muddy rules, this is the definite 3.5 experience. 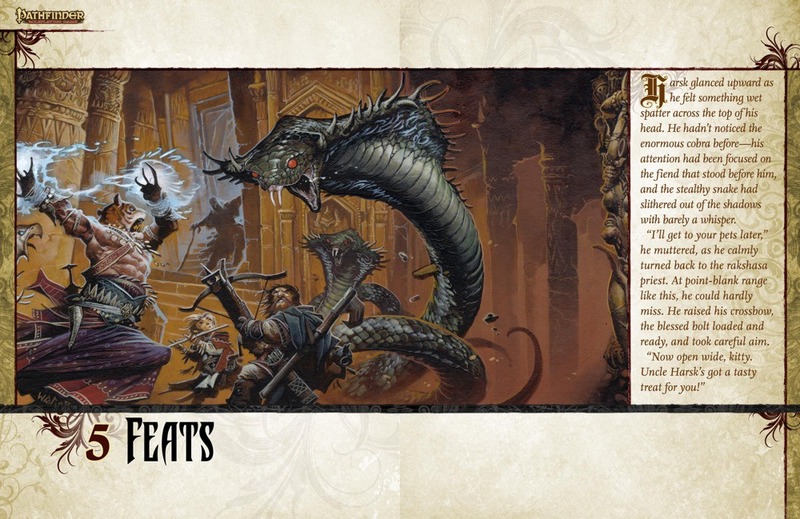 Never played Pathfinder as I had some good old fashioned hate for 3.5 but this sounds interesting. Might have to give this a second look. Now I also really liked the concept from alternate paladins in 3.5, and think they should have offered those as archetypes. They probably should have presented the Paladin as a “Crusader” class with LG archetype as the Paladin and other archetypes named separate but equally interesting things. LE is maybe the Anti-paladin. CE is the Blackguard, etc. The interesting part, in roleplay vs system is rationalisation. As long as a Paladin can rationalise their actions as being good, even if they’re monstrous, then he will continue to be a Paladin, as his own personal code will stay untouched and he will believe that he hasn’t strayed from the path. The Book of Exalted Deeds, now very, very old was great in this regard, it showed you just how nasty and even downright evil the “good” could be. I’ve had Pathfinder players who’ve rationalised pretty much everything, and in those cases they need a swift kick in a pants by someone else, preferrably another Paladin, a better or ever worse guy who tells them they’re wrong in how they’re doing things. I do like Paladins of all alignments, even Chaotic. Chaotic Good Paladins are great and have a lot of freedom. They’re basically the guys doing things for the Greater Good, even if that means acting unlawfully.